If you've known me for long on Twitter, Facebook, or my old blog site, then you've heard me mention the "sand pool" more than a time or two. It's easy to tell someone that our "sand pool" is just that: A pool...filled with sand. It just doesn't quite sink in, though, until you see it first-hand. It's at that point that you realize I'm not talking about a tiny kid's pool filled with sand. I'm talking about a giant, L-shaped pool that is 12 feet deep at it's deepest point, and is filled with sand. It has taken us 2 summers to get this "pool" to where it is today. 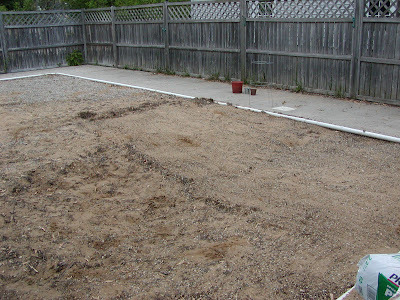 When we first acquired it, it was full of not only sand and rocks, but weeds...and LOTS of them! The weeds, combined with many, many sprouts of maple trees (thanks to "helicopter" seeds that are in over-abundance here) left this "pool" anything but fertile for growing anything "normal". With the kind help of a neighbor and many new tools I didn't even know existed, we pulled, we dug, we plowed, we made it look pretty. After doing so for two summers, we have finally seen the fruits of our labor. This year, we had very little of the weeds and maple. We were finally just dealing with a sand pool with some rocks on the top. What next? 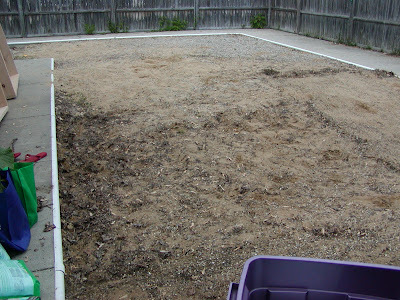 We really wanted a garden, but the entire rest of the back "yard" was concrete. Literally. All of it. 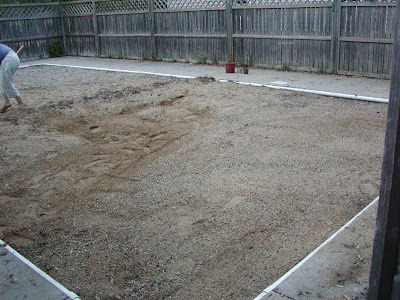 After much research over two years, we decided to build a square foot garden...ON the sand pool! I've got tons of pictures and fantastic fruits, veggies, berries, and herbs growing. For now, have a look at what we started with (Ignore the green on the sides. The houses on either side of us BOTH went into foreclosure. To say there is overgrowth is an understatement. I've done all I can on my side. I'll be going over to the other side to try and fix the problem spots within the next couple of weeks.) Enjoy! Now we've seen the "before" pics, where's the "after" pics? They're coming! Patience, please. In the meantime, feel free to go next door and look. :-)Now you know I wouldn't say this to just anyone.